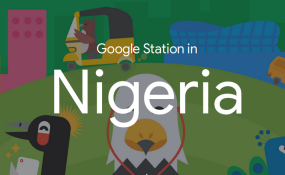 Google Station's web page about its presence in Nigeria. Last week, a large white tent sprung up in the garden of the Ventures Park compound off Aso Drive, in Maitama, Abuja, taking its place alongside the beautifully decorated offices that house the companies based in the park. On Friday morning, the 18th of May, the comfortably furnished tent, with its red-carpeted floor and an elevated green stage at one end filled with people, men and women, young and old. Some were formally dressed in suits and traditional Nigerian formal attire, others were dressed more casually, in jeans and t-shirts. There was excitement in the air. It was the opening event for the 2018 Health Meets Tech Hackathon, organised by the Abuja based public health consultancy firm EpiAFRIC and Texas-based PandemicTech in partnership with Tech Ranch, Nigeria Health Watch, PharmAccess Nigeria, Digital Health Nigeria, Sterling Bank, ProMED, Efferent Services and Ventures Platform Foundation. The hackathon was to bring together participants from the health and tech industry to work together on solutions to help the Nigerian health sector. Unlike the 2017 challenge which had focused broadly on health, this weekend's event was aimed at bringing health and tech together to develop innovative solutions to the many challenges that Nigeria faces in infectious diseases. Nigeria's recent challenges with Lassa fever and the ongoing outbreak of Ebola in Congo made this theme seem particularly apt. Traditionally, when we think about tackling infectious diseases we look to the likes of epidemiologists and virologists and not app developers or "techies". The #HealthMeetsTechNG Infectious Diseases Hackathon may have just changed all of that. By the end of the event on the evening of Sunday evening, participants agreed that it had been an exhilarating process, a rare Abuja weekend that had given room to the development of new ideas for health-tech innovations against infectious diseases. Prof Oyewale Tomori, eminent virologist and immediate past President of the Nigerian Academy of Science, who gave the keynote at the opening session was emphatic in his address; "I'm here to see us ‘hack the thorn' out of infectious diseases in this country!," he said, adding, "When we address health, we must not address it in a silo. Figures should translate to people. We must look at the relationship between the figures we analyse and the people that these diseases affect." He urged hackathon teams to "Keep it simple and …think about technologies that are functional and easy to adopt." On the first day of the hackathon, a panel of key health and tech figures took part in a moderated discussion led by Dr Ike Anya, Founding Partner at EpiAFRIC. The panel included Dr Chikwe Ihekweazu, CEO of the Nigeria Centre for Disease Control, Dr Andrew Nerlinger, Co-Founder of Endura Ventures, Kola Aina, Founding Partner at Ventures Platform, Emeka Ajanwachukwu, Director of Health Plans at PharmAccess Foundation and Ezinne Anyanwu, MD/CEO of Efferent Services. Given that the goal of the Hackathon was to discover, incubate and support market-worthy solutions that will help improve the management of infectious diseases, panelists shared insights about what areas were of greatest interest, the pitfalls to avoid and in sharing their rich experience, inspired hackers to think of effective practical solutions, appropriate to the Nigerian context. Dr Anya also emphasized the importance of everyone present, whether they were part of a team or not, taking the opportunity to learn, make new connections, and build new relationships. He emphasized EpiAFRIC's commitment to continuing to foster the relationship between the health and tech sectors, pointing out that he had heard that two people who met as observers at the 2017 hackathon, were now developing a startup together. He also said that in making sure the highlights of the hackathon were recorded and available online, hopefully, they could serve as a resource for people who were not physically present, but who might be inspired by the ideas shared to start something of their own. The opening session also featured a special guest, the United States Ambassador to Nigeria, W. Stuart Symington, who pointed out the power and importance of shared ideas. "In 72 hours you can change the course of Nigeria's health forever by the attitudes and the ideas you share. The greatest challenge in the health sector is what each person does," he said. Following the detailed pre-hackathon preparation, which included a Health Meets Tech Tour in Kaduna and Jos, a Hackathon Meetup, and a Webinar for the hackers a day before the event led by the mentors, it was time for the hacking teams to put their skills to work and ‘hack the thorn' out of infectious diseases. The teams had their first chance on the second day of the hackathon to present test pitches of their proposed solutions to the mentors and receive valuable feedback ahead of the final hackathon presentations. Tech Ranch Partner, Kevin Koym of Tech Ranch observed during the test pitches, "It is immediately visible how the technologies that are being built by the #HealthMeetsTechNG Hackathon teams would save lives and lower healthcare costs in Nigeria." The lead presenters in each team also had the opportunity to be coached on how to pitch by Michael John of VP Foundation, and it was exciting to see how after just half an hour of coaching, they were able to provide more engaging accounts of their projects than they had at the beginning. The judges for the hackathon were Kola Aina of Ventures Platform, Dr Ike Anya of EpiAFRIC, Anna Ekeledo, Executive Director of Afrilabs, Bankole Oloruntoba, Founder, Network of Incubators and Innovators in Nigeria and Dr Nkem Momah, Head of e-health at the National Information Technology Development Agency (NITDA). For Dr Ike Anya, he was looking out for ideas which would bring together interesting technological solutions with a thorough understanding of the health challenges that they were trying to solve. By Sunday evening, when it was time for the final presentations, it was wonderful to see how much work the 9 short-listed teams (out of the 70 teams who had applied to take part) had put in to come up with innovative solutions to pressing problems. The criteria for judging included- the significance of the problem being addressed, the appropriateness of the solution proposed, and the financial and practical sustainability of the proposed solution. Judges were keen not to just focus on the solution proffered, but also looked for evidence that the teams had considered who their target audience were and had thought about the marketing and business strategy to use to attract them and encourage adoption of the solution. Team Sample Movers aimed to bridge the gaps in the movement of samples arising from routine and emergency surveillance from the collection points to the laboratory with an "uber"-like transportation model that also incorporated training up a workforce of sample takers in each community. Team Yiino developed an app to educate kids in a fun way about handwashing and other ways of preventing infectious diseases. Team Emcorp presented Sanibands, a portable hand sanitizer in a hand band, with a web-based app where orders can be placed for them. Team Safe created a surveillance system, where users can report suspected infectious disease outbreaks. Team Datex leveraged on mobile technology to create a product meant to help improve health care access in rural areas. Team MedShell created an app and web-based symptom checker to help people become more aware of the signs and symptoms of infectious diseases and signpost them to relevant health facilities. Team AyunaHealth designed a mobile app to improve verified health workers reporting of suspected cases of notifiable infectious diseases to the appropriate public health authorities and enhance health workers' awareness of on-going possible or confirmed outbreaks. Team V-Spotter came up with a One-Health approach- a platform where users can access veterinarians advice and treatment for their animals and through which vets can more easily report animal infectious diseases to relevant health authorities. Team Corona Management Services created BetaLyf, a solution designed to scale up routine immunization by sending reminders to mothers or caregivers via SMS to take children for vaccination. All nine teams confirmed Ambassador Symington's theory that you can change the world in 72 hours. From new ideas or expansion and modification of existing ideas, in 72 hours, they came up with potentially workable solutions that could help tackle some of the pressing issues in the Nigerian health sector. ‘SaniBands', an "effective and fashionable hand sanitizer in a hand band", with an app and online platform where users can order refills, was the winning solution at the 2018 Infectious Diseases Hackathon. Proposed and presented by Team Emcorp, it was led by Emmanuel Egbroko, a Tony Elumelu Foundation (TEF) 2018 Fellow. In second place was Team AyunaHealth's mobile app designed to allow verified health workers to report and notify health authorities about suspected cases of infectious diseases. They were inspired by the experience of Dr Folakemi Cole-Adeife, a team member and senior registrar in medicine at LASUTH. She had spoken about the challenges she and her colleagues faced with the existing methods of notification. In third place was an idea that leveraged on the popular "Uber" transportation model but for the movement of infectious diseases samples from collection point to laboratories, presented by Team Sample Movers, allowing more rapid diagnosis and earlier identification of possible outbreaks. Teams received cash prizes as well as registration into an incubation programme to help support them as they get their solutions ready for market. Ideation – This module is designed to introduce the student and potential incubates to what a start-up is. Teams will learn how to discover an idea, validate it and develop a testable business model around this idea. Launch –This module guides on how to achieve a product-Market fit for the product/solution and begin to gain traction. Grow – This module is designed to equip a startup with the fundamental skills, structure and know-how to sustain and scale its product/services. Award-winning social impact entrepreneurship training from world-renowned technology startup incubator. Access to International virtual ecosystem and mentorships. Finding and pitching ideas are not the biggest challenge, determination to follow through to reality is more crucial. As they enter the next stage of developing their ideas, all the teams should remember this. Dr. Lawal Bakare of EpidAlert pointed out during one of the mentoring sessions that BudgIT came third place at a hackathon, but today it is more well known and more successful than the teams that came first and second place. The bespoke mentoring process developed by EpiAFRIC and partners will hopefully help the winning teams incubate these solutions from ideas to reality. The teams also had the opportunity to hear from Paddy Anigbo, a member of SwiftEC, the team that won first place at 2017's challenge. He spoke about how his team was continuing to develop their product. They hope to bring it on stream later this year, and he discussed the challenges they have faced. He warned that winning the hackathon is just the beginning. The #HealthMeetsTechNG Infectious Diseases Hackathon was made possible by a consortium of partners invested in helping change the infectious diseases space in Nigeria. These include the creatives at PandemicTech, a program of Endura Ventures; Tech Ranch, a venture accelerator; PharmAccess Group; ProMED, DigitalHealth; Efferent Services; Sterling Bank and Ventures Park. For us at Nigeria Health Watch, the hackathon was a cogent reminder that great solutions begin with simple ideas, and the solutions we need in Nigeria's health sector may just be one, or two ideas away… from reality.